"Willing takes you to the success and continuous efforts help in achieving your goals. " Only with this thought, I started using the internet to give a new move in my life and still this process going on. It was the time when I thought that Internet means surfing, chatting, and doing emails. I was not much aware of the vastness of Internet and not even tried to know, as I was happy with my job and whatever I was doing there. But as the time passes the satisfaction level fell down and my interest in Internet went up. Then one day I thought of making money from the internet so joined a website which was PTC ( paid to click), it was very small amount but I never left it. Soon, the day came when I redeemed those collected points and the reward was 50 rupees Cafe Coffee day voucher. It was the first success and I was happy to prove slow and steady wins the race. Speeding Steps: Now I was quite happy with that only 50/- voucher because that 50/- has pumped up my enthusiasm and I have registered two more websites, one was again PTC and one was task-based. I worked on those websites for long and now that time I redeemed my points with 1200/- and $8. Time was like in my favor and paced up my working on these online sites from where I was earning a little extra. Influenced by Social Media: Now, I stepped towards Facebook and Twitter. Initially, I was quite fascinated by Facebook and I started using it for my personal use, then one day I was invited to a contest and my participation made me win. Through that participation, I came to know more about Twitter, Instagram, G+ and some blogs. Now my involvement in the contest went up and I won many things besides all this I never left working on those sites which gave me some extra money. Now I was on almost all famous social media accounts and I was using them for some personal and for contest purposes. Survey Sites: I was highly influenced by survey sites because they have given me that extra income which helped me a lot in my life. I don't have an accurate figure but I earned more than 60 thousand last year, only by working on an average 3-4 hours per day. Steps towards blogging: Now I want some enhancement and want to utilize my capabilities in a right direction. This thought also come up because I was fed up with the politics in offices and dual roles of people. I want to do something where I can use my full energy without wasting it on useless things. Blogging was the platform which influenced me a lot and I started writing on it side by side. But I didn't stop my work on all those survey sites. Campaigns: Now I started my blogging with my own ideas and share those blog post on social media accounts. And one day I got an email for joining a campaign, I accepted and worked on it. It was liking working out of the box for me and soon worked on some campaigns, some collaborations, and then conducted some giveaways. This increase the level of traffic and people started following me. 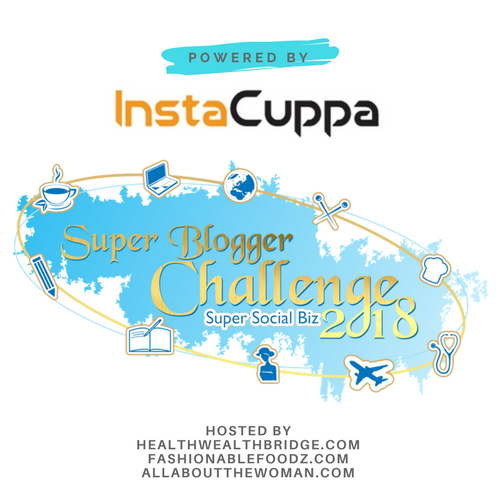 #SuperBloggerChallenge2018: It was like a grabbing of a big deal for me. I accepted this challenge, initially, I find myself very weak as I was finding myself standing on the first ladder. A question keep on hitting me " How will I cope up with these senior bloggers? So, I set my mind instead of beating anyone, keep on working on it. This is my learning phase and I need to learn a lot, Today when I am writing for the 10th-week post, I am feeling glad and happy that may be slow but I reached up to this level. The Internet- A resource Pool: Internet is a treasure of knowledge, only our dedication, and keenness of learning new things are measured. I have started my work on the internet with 0.25 paise but this is the only internet and continuous work turned that 0.25 into 60,000/-. So, make it a habit of learning and reading anything from the internet. conducted by Healthwealthbridge.com, Fashionablefoodz.com, Allaboutthewoman.com and should not be repurposed, republished or used otherwise. The content herein is owned by the blogger. SuperBloggerChallenge2018 is not responsible for any kind of infringement caused.